We have a friend, Sarah, who is a librarian. She is extremely excited about the house, and she emailed me today to let me know she has started research for us. 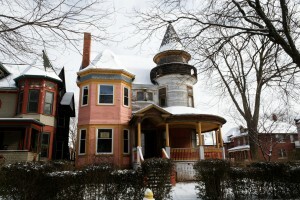 She discovered from the Detroit Public Library that the house was owned originally by Daniel Sullivan and that it was built in 1899, and that the address used to be different. Apparently Detroit redid their addressing scheme in 1920-1921. The closing is scheduled for Tuesday. Today we visited with an electrician to get some estimates of what we’re getting into. While there, we discovered that some previous tenant was clearly interested in the history of Woodbridge in general and the house itself. “Daniel Sullivan was born June 26, 1867, in Detroit. He was the son of Daniel Sullivan and Julia (Finn) Sullivan. Daniel attended the public schools in Detroit and also business college called the Detroit Business University. In 1887 at the age of 20, Daniel began his career in business with his father’s firm, Daniel Sullivan, Coal and Coke dealer which had been established by his father in 1881. Sullivan spent forty-seven years with the firm, first as a clerk and later, after his father’s death, as president of the firm. Mr. Sullivan was president of the firm at the time of his death. Mr. Sullivan was a member of the Detroit Board of Commerce, the Detroit Athletic Club and the Detroit Golf Club and in 1914 listed “automobiling” as one of his favorite forms of recreation. Sullivan was also a member of the Knights of Columbus, fourth degree, a Roman Catholic, and one of the founders of Visitation Church. Sullivan was a Democrat in politics but did not run for any public office. On October 6, 1890, Daniel Sullivan married Catherine Thompson of Detroit. Miss Thompson was the sister of William B. Thompson who was later mayor of Detroit from 1907 to 1909 and 1911 to 1913. The Sullivans had two daughters Catherine E. and Frances R.
Daniel Sullivan died February 11, 1934 in Charles Godwin Jennings Hospital in Detroit. He is buried at Mt. Olivet Cemetery, Detroit, Michigan. The Sullivan House at 4304 Avery, was built for Daniel Sullivan by Stephen Lindner. The building permit for the home was issued June 3, 1898 and the two-story wood dwelling was valued at $2,500.00. On October 27, 1898, Frank Jahnke, a carpenter, took out another building permit for another structure on the Sullivan property. The result was a two-story wood barn valued at $400.00. There you have it. I’m sure Sarah will be able to dig up more at the Detroit Public Library. This entry was posted in The Sullivan House by primesuspect. Bookmark the permalink.